1. Are the bowls durable? Yes, the bowls are very durable. Thanks to a technique of making the product, high quality materials and a careful process of manufacturing, the basins are exceptionally durable. We would also like to inform you that the bowls are made from ceramics and as always with products made from such a material they might get damaged due to improper use. 2. Are the designs on the bowls resistant to abrasion? 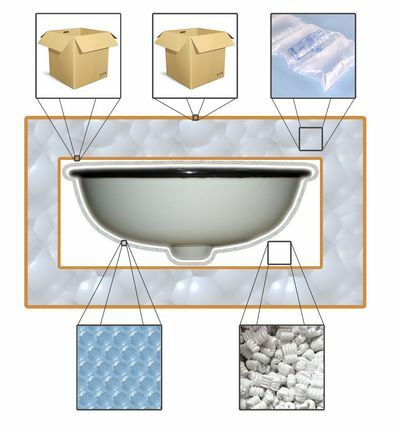 Yes, the designs on the bowls are resistant to mechanical and chemical damage. Since each element of the design is made with use of paint, which is at the same time part of the glaze, the designs are resistant to abrasion and scratching. In case of scratching the surface of the bowl (unfortunately, titanium coating for basins has not been invented yet), the design remains intact due to the fact that the bowl was covered with a thick layer of paint/glaze. 3. Are the sinks safe for health? Yes, our bowls are safe for your health. All the materials and substances used in the process of manufacturing the bowls are of natural origin. The pigments included in the glaze are lead-free. 4. Do the sinks have an overflow hole? No, all the ceramic bowls in our shop do not have an overflow hole. 5. What is the size of the drain hole? All the ceramic wash basins have got a standard size drain hole. 7. Is it possible to see your wash basins in a regular store? At present we do not run a offline store. However, in the nearest future we are going to exhibit individual products in the largest bathroom showrooms in Poland so that it would be easier for our customers to make a decision. 8. Will the basin be exactly like the one in the photograph? Due to the fact that each bowl is hand painted (the design is also put on by hand) and each of them is unique, the bowl delivered to you may slightly differ from the one shown in the photograph. The differences may be visible only in tiny details of the design. You may collect the ordered product straight from our storehouse in Warsaw. Our products have 2 years guarantee (the guarantee does not cover damage caused by improper use). In case of a return of a product under guarantee, we will replace it with another one, or if there are no such left in the storehouse or if it is impossible to order one from the manufacturer, we refund the whole cost of the purchase. The goods damaged in transport may only be returned if the courier confirms that the product was defective on arrival (please remember to open the parcel in the courier's presence). We believe that our products will fulfill all the expectations of our customers. However, we are aware that in case of products so original and unique like ours, the decision whether to buy them or not may be difficult. Still, if you have made up your mind and bought our product, but on second thoughts you feel that it does not fulfill or suit your needs, there is an option of return or exchange for another one (at the same price). You may return the product within 14 working days from the day of the delivery. 2. Not pay any extra VAT (added tax based on the cost of the commodity, shipment and customs duty). The VAT is imposed at customs so the prices given by our competition do not include the hidden cost. All our prices include VAT. 6. You may always count on us to assist you, advise you and offer discounts in case of larger orders. We hope that we have managed to answer most questions. However, if you still have some doubts or queries, feel free to contact us via e-mail. We will be happy to answer any questions.